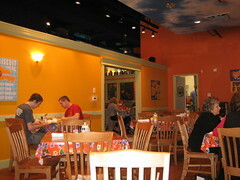 My mother and I were starving by the time we were heading towards downtown and I remembered that Flying Biscuit was on the way to the SPCA. We stopped in in the early afternoon and didn’t have to wait for a table. The menu had been calling out to me, but what to order? Something with the fried green tomatoes? Well I needed to try the biscuits for sure. 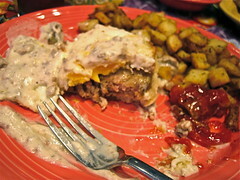 I ordered the country eggs benedict, a poached egg with country sausage patty on a biscuit with country gravy. It was heavenly. Mom ordered whole wheat french toast, which came with creme anglais and raspberry sauce drizzled on top. The sauces on top reminded me of the two types of doughnut filling, raspberry and boston cream. It was hard to stop eating. 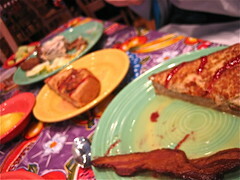 The bacon was thick and crisp, the sausage was tender and the gravy had just the right touch of sausagey flavor. The service was good and the food was good, there’s not much more to say. 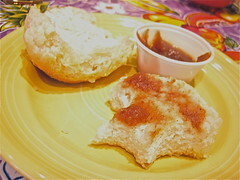 With breakfast available all day, why not give the biscuits and cran-apple butter a try? You should go back because this was one of the worst dining experiences I have had in Raleigh. Marginal food and horrible service. It was systemically bad and gave me the impression the owner had never run a restaurant before. Everyone I know has had equally bad service. And I rarely complain about things. I love the ambiance, but its really a star at best.